Ingredients: Maltodextrin, Bulking Agent: Microcrystalline Cellulose, Inulin, Magnesium Oxide, Borage Oil (Borage Seed Oil [Carriers: Maltodextrin, Silica & Antioxidant: Sodium Ascorbate]), Evening Primrose Oil (Carriers: Maltodextrin, Antioxidants: Ascorbyl Palmitate, Ascorbic Acid, & Mixed Natural Tocopherols, Starch) (from Soya), Vitamin C (Ascorbic Acid [Carriers: Hydroxypropylmethylcellulose & Tartaric Acid]), Tablet Coating (Hydroxypropylmethylcellulose, Hydroxypropylcellulose, Capric/Caprilic Triglyceride, Natural Source Colours [Titanium Dioxide & Iron Oxides]), Anti-Caking Agents: Stearic Acid, Silicon Dioxide & Magnesium Stearate, Vitamin B12 (Cyanocobalamin [Carriers: Starch, Silicon Dioxide, Trisodium Citrate & Citric Acid]), Vitamin E (D-Alpha Tocopheryl Acid Succinate) (from Soya), Niacin (as Nicotinamide), Ferrous Fumarate, Zinc Sulphate, Cross-linked Cellulose Gum, Thiamin (Vitamin B1 as Mononitrate), Citrus Bioflavonoids, Vitamin B6 (Pyridoxine HCl), Betacarotene (Carriers: Starch, Water, Antioxidant: DL-Alpha Tocopherol), Pantothenic Acid (as Calcium Salt), Manganese Sulphate, Riboflavin, Vitamin D2 (Ergocalciferol [Carriers: Maltodextrin, Ethyl Cellulose & Antioxidant: Mixed Tocopherols]), Copper Sulphate, Vitamin K1 (Carriers: Acacia & Sucrose), Folic Acid (as Pteroylmonoglutamic Acid), Chromium Trichloride, Sodium Selenate, Potassium Iodide, Biotin. Allergy Advice: For allergens, see ingredients in bold. TWO TABLETS PER DAY WITH YOUR MAIN MEAL. Swallow with water or a cold drink. Not to be chewed. Do not exceed the recommended intake. To be taken on a full stomach. Food supplements must not replace a varied and balanced diet and a healthy lifestyle. As with other food supplements, consult your doctor or pharmacist before using if you are under medical supervision, pregnant, breast-feeding, have epilepsy, a thyroid condition,haemochromatosis , suffer from food allergies, or are allergic to any of the ingredients. Allergy Advice: For allergens, see ingredients in bold. Made in a site that may handle nuts. 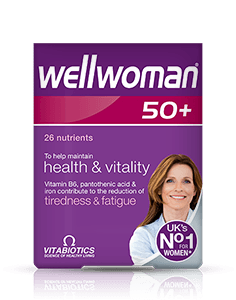 As Wellwoman contains vitamin K, if you are taking anticoagulants (blood thinners) do not take these tablets except on the advice of a doctor. This product contains iron, which if taken in excess, may be harmful to very young children. 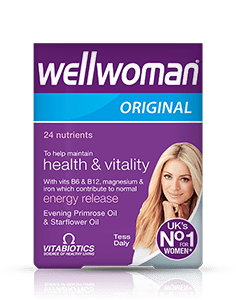 Why has Wellwoman Vegan been developed? When is Wellwoman Vegan recommended? Can Wellwoman Vegan be taken during pregnancy and breast-feeding? Can Wellwoman Vegan be taken simultaneously with other medication? 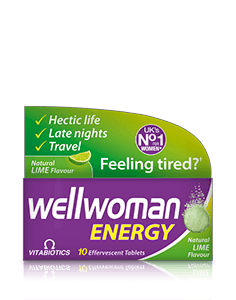 How many tablets does one pack of Wellwoman Vegan contain? 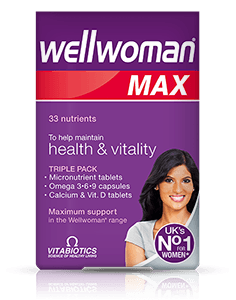 Are there any undesired effects while taking Wellwoman? 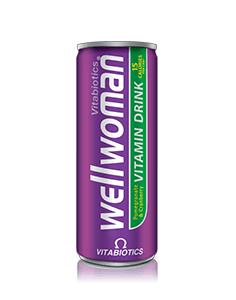 Wellwoman Vegan has been developed specifically for women following a vegetarian or vegan diet. This comprehensive daily multivitamin contains a wide range of nutrients and trace elements including evening primrose and starflower oil. 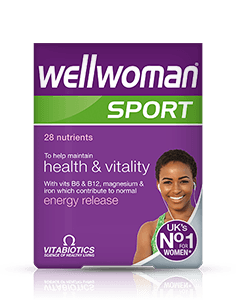 Wellwoman Vegan is unlike other general multivitamin and mineral supplements in that it carefully balances micronutrient levels and gives support to the areas of health which are of most relevance to women. The formula includes a vegetarian and vegan form of vitamin D plus higher levels of iron and vitamin B12 (compared to Wellwoman Original) especially for vegetarian or vegan diets. 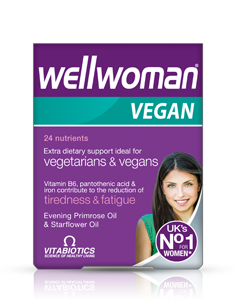 Wellwoman Vegan is recommended for women of all ages as a daily nutritional safeguard for general health and vitality. 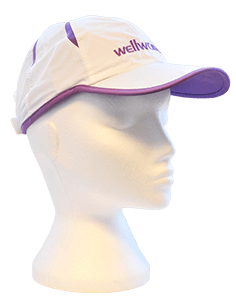 Wellwoman Vegan is ideal for those women following a vegetarian or vegan diet and who lead an active lifestyle. The formula contains a wide range of nutrients and trace elements to support the areas of health which are of most interest to women including Vitamin B6 which contributes to the regulation of hormonal activity, plus iron which contributes to normal formation of red blood cells and haemoglobin, an important consideration during the monthly cycle. During pregnancy, we would recommend a multivitamin supplement specially formulated for pregnancy, such as Pregnacare. Pregnacare (from Vitabiotics) contains a careful combination of 19 vitamins and minerals, can be used from before conception, throughout the whole of pregnancy, and also whilst breast-feeding. Pregnacare Original and Pregnacare Liquid are the only products within the range suitable for vegetarians (not suitable for vegans). Pregnacare is recommended as soon as you start trying for a baby. However, there is no problem if you become pregnant whilst taking Wellwoman Vegan, since it contains 400µg folic acid and 10µg vitamin D, as recommended by the UK Department of Health. Wellwoman may be used during breast-feeding if required. Generally, Wellwoman may be used alongside medications, because it contains only moderate levels of vitamins and minerals, and is free from any drugs or hormones. Wellwoman may also be used alongside the contraceptive pill. For specific advice on taking Wellwoman with medicines, we recommend that you contact your doctor or pharmacist first. 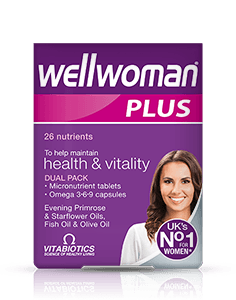 Wellwoman Vegan is available in 60 Tablets (1 months’ supply). It is recommended to take two tablets per day. Wellwoman has no known side effects when taken as directed. Do not exceed the recommended tablet intake. In case of overdose, seek medical advice immediately. 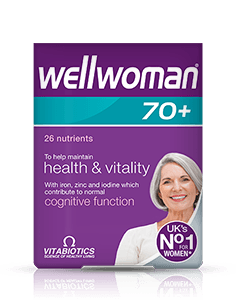 Results vary amongst individuals, but in most cases, we would expect the beneficial effects of the vitamins and minerals in Wellwoman to build over several weeks, with noticeable results in one to three months. There is no maximum length of time over which Wellwoman may be used. A regular intake is recommended.